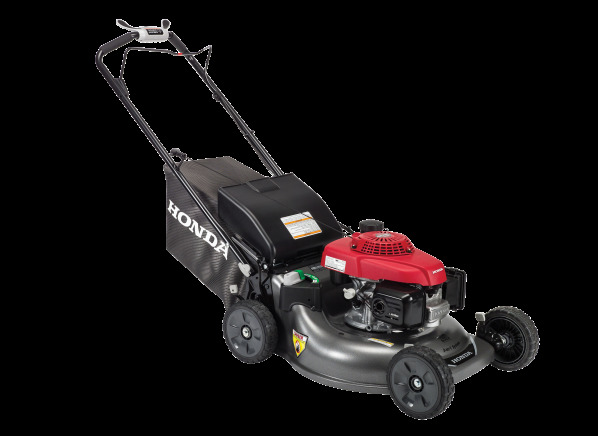 The Honda HRR216VKA is part of the Lawn mower & tractor test program at Consumer Reports. In our lab tests, Lawn mower & tractor models like the HRR216VKA are rated on multiple criteria, such as those listed below. Blade brake clutch Blade brake clutch This safety feature automatically stops the blade when you release the handle, without shutting off the engine, so you don't have to restart the mower every time you clear debris or empty a grass bag. Deck height adjustment Deck height adjustment Most convenient is a single lever that moves the entire deck up and down. Some models have one lever for the front axle and another for the rear. Least convenient is a lever at each wheel. Swing-up handle bar Swing-up handle bar Ability to easily fold the handle bar forward to aid in storage. Upright storage Upright storage Allows the user to store the lawnmower vertically reducing the storage footprint. High wheels High wheels Large rear wheels marketed to handle bumpy terrain better than standard size wheels. Optional discharge chute Optional discharge chute The rear-mounted side-discharge chute does not come standard with the product and must be obtained separately if you want the side-discharge cutting mode. Some will be provided free when you return the product's warranty card, while others range in price from $15 to $30. Deck size (in.) Deck size Most models have a deck size, or cutting swath, of 20 to 22 inches. There is no significant advantage from one size to another. A larger deck can cut more grass in a single pass, but in this size range the difference is negligible. Engine manufacturer Engine manufacturer Stated manufacturer of a gasoline engine. For some mowers the engine manufacturer is not documented and is listed as "self branded." Engine size (cc) Engine size Engine size in cubic centimeters (cc) provides a rough indication of the engine's power. Mower warranty Mower warranty The length of time in years the lawn mower is covered by its manufacturer for defects or repairs.